While contemplating the subject for the latest post in the Bible category, I wrote the following question in my idea log: “Does it matter if you do not find Jesus in the Old Testament?” For those in the field of Religion, whether it is on the academic side or in ministry, this question comes loaded. As a student of the Hebrew Bible, I encounter this question constantly, especially in the context of teaching. Therefore, I decided to address this issue, from my own perspective of course. However, this topic is too massive and complex for a single post, therefore this will be the first in a three-part series addressing the question. If this topic offends you in some way or you find my reasoning flawed, I ask that you read all three parts before passing complete judgment. As always, I welcome feedback and comments. My main premise in this article is as follows: The notion of Jesus the Messiah as foretold in the Old Testament is inaccurate, as the evidence used is constructed from various texts in order to create a composite prophecy. The Old Testament existed before the time of Christ and presents the religious history of the people of Israel, a history that existed within its own setting. Therefore, I will demonstrate that so-called Messianic prophecies are explained within a historical context, without pointing towards the figure of Christ in the New Testament. For the faithful Christian, the purpose of the Old Testament (Hebrew Bible) is typically relegated to a series of difficult names to pronounce, involving difficult events to comprehend, with an angry wrathful God, and a myriad of passages pointing the way to Jesus. I hate to be the bearer of bad news, but these descriptions could not be further from the truth (although I will admit Semitic names and words can be difficult without proper guidance). One does not need to find signs pointing to Jesus in the Old Testament because the cultural milieu presented in that canon provides the religious background for Jesus. In other words, one can trace the religious realities of Roman Empire, 1st century CE, diaspora Judaism back through the intertestamental period, and to the return from Exile in Ezra. Examining every passage appropriated for Jesus is not within the realm of reality for this post, thus I will use one popular example. The Book of Isaiah is typically thought to contain numerous prophecies of the future as well as the prediction of the coming Messiah. This is true, however when read in the proper historical context, it is clear that the Messiah of Isaiah is Cyrus of Persia. Even the beginning of chapter 45, “כֹּה־אָמַ֣ר יְהוָה֮ לִמְשִׁיחֹו֮ לְכֹ֣ורֶשׁ” which translates to “Thus said Yahweh to his anointed one/Messiah, to Cyrus,” explicitly refers to Cyrus as the Messiah. 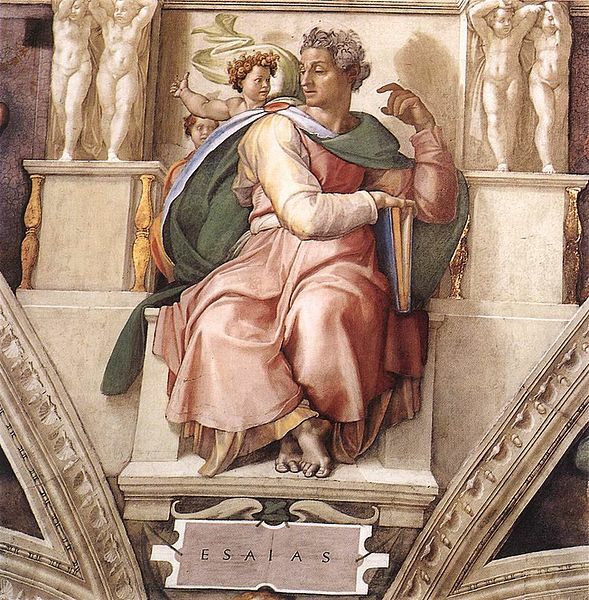 This portion of Isaiah (modern scholars identify no less than three schools of thought in Isaiah, but that is another post) does not look forward to a coming Messiah, but rather sees one in the foreign king that, according to the Bible, allowed the exiled Israelites to return home to Jerusalem. This is echoed in the Book of Ezra’s account of the returning exiles as chapter one presents the reader with the “Cyrus edict,” a likely constructed document on the part of Israel, which claimed to be a written command from Cyrus himself, allowing the Israelites to return home and rebuild the temple. The writer also makes it clear in the first four verses that Cyrus is the answer to Jeremiah’s prophecy regarding the promise to return Israel to the land. My final analysis of Isaiah is a look at one of the most famous passages that is linked to the New Testament. Isaiah 7:14 says, “Therefore the Lord himself will give you a sign. Look, the young woman is with child and shall bear a son, and shall name him Immanuel” (Isaiah 7:14, NRSV). This passage was picked up by the writer of the Gospel of Matthew and used as a prophecy for the virgin birth of Christ. Again, with any text, context is the key factor. The overall chapter is a discussion regarding King Ahaz, with this statement likely referring to his son, King Hezekiah, or possibly even Isaiah’s son. Furthering the problem of viewing this as a prophecy for Jesus is the fact that the verbs in the sentence, “to bear (a son)” and “to name,” are not in the imperfect tense, which is the future tense for Biblical Hebrew. Therefore the following, more conservative translation: “Therefore the Lord himself will give you a sign: The virgin will be with child and will give birth to a son, and will call him Immanuel” (Isaiah 7:14, NIV) is grammatically incorrect as the forms do not indicate a future tense, but rather a past, completed action. We therefore do not need to think of the Isaiah as looking forward hundreds of years to a figure that will call himself the Christ (Messiah), but rather look at the historical realities surrounding the Hebrew Bible itself. Other factors remain concerning the term “virgin,” both as it applies to the Isaiah passage and its usage in the New Testament. Join me for part two of this three-part discussion. This entry was posted in Religion and tagged Bible, Book of Isaiah, Hebrew Bible, Isaiah 7:14, Israel, Jesus, Jesus in the Old Testament, Jesus the Messiah, Old Testament, Prophecy. Bookmark the permalink. Upon the crowning of a king (or entering other high functions) as described in the Bible, a person is rubbed with holy oil, “משיחה” in Hebrew means “smearing”. David, for example, refers to Saul as “מְשִׁיחַ ה'”. Its a symbol of a selection of the person by God. The reference to Cyrus as “משיח” not necesserily identifies him as The Messiah, but may refer to his job as a king. Further, I think that signs in the Tanakh pointing specifically to Jesus of Nazareth are a theological question than a matter of historical research – you either believe it to be a specific reference to Jesus of Nazareth or not. If you believe Jesus was The Messiah, then undoubtfully all preceding profecies refer to him. If, as Jews do, you believe The Messiah is still to come, then, of course, the profecies can not refer to Jesus. Many religions, if not all, contain some form of prophecy to the birth of a/the savior. I therefore think that a faithful, whether a Christian or otherwise, would be well-advised to separate beliefs and scientific analysis (linguistic, historical, psychological or otherwise) when studying holy texts. Andy, you say, “This passage was picked up by the writer of the Gospel of Matthew and used as a prophecy for the virgin birth of Christ,” and then go on to refute the writer of Matthew. You know who most believers think wrote the New Testament, right? It is the inspired word of God. He is the ultimate author, not the man with the pen in hand. So, are you saying that the NT is inaccurate in saying that the OT prophesied Jesus as the messiah? For if you do, then shouldn’t we find no truth in the NT? And if the whole NT is faulty, then isn’t this an indictment of our Christian beliefs in general? I put it to you, Andy – isn’t this an indictment of our entire worldview? Well, you can do whatever you want to us, but we’re not going to sit here and listen to you badmouth Christianity and the United States of America. Gentlemen! Okay, seriously – I look forward to the other two parts to see how you can support your thesis and maintain the integrity of the New Testament at the same time. Thank you all for the comments! I will post again on here soon, but most of these issues will be addressed in part 2.